The Modern Residential Hinge Pin Door Stop is great for those who don't want their door stops awkwardly protruding from their doors. It keeps both your walls and your hardware safe without putting stress on the door, the door frame, or the wall because the hinge pin stop hits the hinge leaf. This type of door stopper is also great for use on doors where a traditional door stop just isn't possible such as where one door opens into another door. It is easy to install, just remove the standard hinge pin and replace with the hinge pin door stop. Available in Polished Brass, Oil Rubbed Bronze, Satin Nickel, and Polished Chrome finishes. 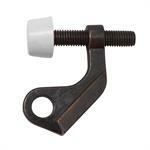 Works with either 4" x 4" hinges or 3-1/2" x 3-1/2" hinges with a 1/4" hinge pin. Make sure you have at least 3/8" from the hinge barrel to the wall or adjacent trim. Opens to 170 Degrees. Can be adjusted to open further. Hinge pin stop hits the hinge not the door or the frame.